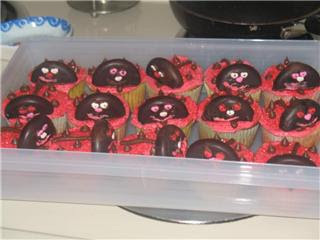 So I decided for Kamryn's b-day I would make cupcakes for her to take to school. I had my plan on how they were going to be done. I had everything ready and Morgyn decides she wants to help, so like any good mother I delegated the task of ladybug faces to her. Nothing like passing off the hard part ;-) I think she did quite a nice job, my favorite has to be the mad looking one in the 2nd row 2nd one from the right. It is so cool how their faces look so full of expression. So Morgyn says when we are done "how come they don't look like the ones in the magazine??" Ah well my dear they are done by professionals! With all the right tools etc. We tried LOL. The kids loved them. On Sunday we are doing her party and going to see Shrek 3 I am going to make a cake with Shrek letters on it, fairly simple I figure. Stay tuned. The cupcakes look too cute to eat! Have a great day! What a cute idea. They look yummy! Ooooo those are so cute!!!! Those look wonderful, and I'm sure the real expressions are better than the fake ones from the professionals! Where did you get that idea?